Is Gnosticism a suitable term? The audio version of the interview is available at the end of the interview. Read Part 1 before experiencing this Gnosis. MC: Another issue your book deals with, and although it seems to have been settled in academia outside of it the debate seems to be going on, and that is the idea of the pre-Christian or Jewish origins of Gnosticism. But don’t you call it basically a “red herring” Dylan? DB: I do. It’s interesting that the idea of the pre-Christian origins of Gnosticism still gets aired today because it is entirely hypothetical. All of our evidence about Gnosticism comes from Christian sources and all of the extant Gnostic texts themselves are products of Christians and Christian communities. All the Nag Hammadi texts are clearly products of late ancient Egyptian Christian communities. If you look at the way the books are put together, the writing and the colophons and so forth they are clearly of some kind of Christian origin, perhaps even of a monastic origin. But, the idea that Gnosticism itself grew out of Judaism or was a reaction to Judaism is of course quite old. There’s a reason that people came to this conclusion which is that one of the main tenets of Gnosticism next to the kinship with God is the idea that the creator of this world is different from the “High” God and does not have your best interests at heart. There’s a cosmic conspiracy and it is levelled against you and it goes to the big man upstairs who, fortunately, is not the biggest man upstairs. That’s the Gospel of Gnosticism. There is a cosmic conspiracy. You’re not crazy but there’s a conspiracy against that conspiracy and you can be part of it!! MC: Makes sense!! Paranoia, a little paranoia’s good for you right?! DB: Absolutely. There is a little paranoia to it and that in so many texts this being against whom this paranoia is levelled is identified with Jewish deity, especially the deity from the Book of Genesis and the Book of Exodus. The jealous God who says that you will have no other gods beside him. Elsewhere he also says he’s also the only God but if he’s the only God how could he be jealous of other gods? It’s a classic point of Gnostic exegesis which we know to have circulated in 1st century Jewish circles. Philo of Alexandria deals with this question for example writing in the 1st century. So one might say, ok, Jews are going through a lot in the 1st century. You have the Jewish war which of course culminates in the destruction of the second temple. THE catastrophe of ancient Jewish history and then you also have the 2nd century Jewish revolts which failed and were also catastrophic for Judaism. So maybe some Jews got pretty dissatisfied with their God who they had fought for and lost a lot for and began to ask these sorts of questions and to turn to other gods. In this case, the great invisible spirit, the deity of Sethianism. This was a reasonable question but it runs against the basic objection that all of our evidence for Gnosticism comes from Christians or comes out of Christian documents. The fact of the matter is that ancient Jewish sources, whether we’re talking about Apocalypses or rabbinic literature do not talk about the individuals who call themselves the Gnostics and they do not identify individuals in their midst who say that there’s another god than the creator God and that human beings have some sort of fundamental kinship with this God. A big red herring here comes from one rabbinic account about the ascent of four sages in to paradise. This is a text that goes back to the (unheard) and it’s common to the (unheard) in both the Palestinian Talmud and the Babylonian Talmud. In the Babylonian Talmud one of these sages, Kirtenaher,, also a nickname for a very famous character in Rabbinic literature – Elisha ben Abuyah who was a sort of naughty type. He looks up at heaven and he sees Metatron sitting down, writing down the merits of Israel and he knows that angels aren’t allowed to sit down, they’re supposed to stand up and praise God eternally. So he asks himself “could it be that there are two powers In heaven?” A weird thought and God’s voice issues forth out of nowhere. Metatron is punished with fiery lashes for giving Elisha ben Abuyah this horrible idea then Elisha ben Abuyah is thrown back in to the world and sort of picked upon by his fellow rabbis for spreading nasty ideas and this led many scholars to think that maybe this is evidence of Gnosticism in rabbinic circles but there are a lot of reasons to doubt this narrative’s relevance to the study of Gnosticism. Of course the kinship of individuals with God is nothing to do with this story. That’s an essential component of Gnosticism that we don’t see here. These stories about Elisha ben Abuyah being a sort of outcast do not necessarily speak more to rabbinic rhetorical concerns rather than some kind of social group or Gnostic undercurrent that you find within Judaism. So scholars have generally thrown out that piece of evidence even though it seems at first sight to lead to something like a Gnostic idea. The idea being that there are two powers in heaven, the evil demiurge and (unheard) God. The downside to the confusion about the Jewish origins of pre-Christian Gnosticism is that it turns attention concerning the relationship between Gnosticism and Judaism and Gnostic sources and Jewish sources entirely towards a question of origins. Where does Gnosticism come from? What is the origin of these particular Jewish mystical ideas that seem to have some sort of affinity with Gnosticism? And since this search didn’t produce much fruit scholars tended in the last 20 or 30 years or so to put Gnostic sources in conversation with other sources, especially Christian sources, leaving aside Jewish sources entirely and what’s too bad about that is that actually many Gnostic sources and especially the Sethian sources almost all of which are Apocalypses and share many literary and thematic relationships with contemporary Jewish Apocalyptic literature got brushed under the Christian rug entirely which lead scholars to misunderstand basic aspects of them which are more easily understood if we put these texts in a conversation with Judaism. So, the pre-Christian origins of Gnosticism is a bit of a red herring and one of the downsides of it is that it led scholars to put Judaism in to an entirely different category from Gnosticism. Where actually many of our Gnostic sources seem to come from some kind of netherworld or border territory between Judaism and Christianity where the Judaeo-Christian identities were still being negotiated in a lot of diverse and different ways and we can see what’s going on in these Gnostic sources much more easily if we actually do read them next to our ancient Jewish sources, especially the (unheard) and Apocrypha and of course the Apocalypses. MC: Dylan, what about the idea, or maybe you can explain what happened, by the time you have the Platonising of the Sethian texts, it seems Jesus has been either marginalised or he’s just become this avatar of this eternal shapeshifting saviour, this Seth figure. Why do you think that happened or is it just what we have to read right now? DB: It’s an interesting question, basically within the corpus of documents from Nag Hammadi that we like to call “Sethian” because they share a shared set of mythologemena concerning celestial beings, especially the idea that Seth, the third child of Adam and Eve is the saviour or revealer of some kind. You have this pocket of literature, the Platonising literature, there are four of them and three of them share names with the Apocalypses that circulated in Plotinus’ seminar according to Porphyry and these texts they are Apocalypses and they are replete with themes from contemporary Jewish apocalyptic literature, clearly products of that environment. But unlike some of the other Sethian texts they don’t say anything about Jesus of Nazareth. So this has led some scholars, most notably, the venerable John Turner to suppose that perhaps they reflect a stage of Sethian literary tradition where there is no longer any identification with Christianity anymore. In his reading, Sethianism grew out of Judaism, became Christianised and then eventually became Paganised actually and you see this reflected in the Pagan philosophical language of the Platonising treatises. I argue that this is a misreading of the evidence. On the one hand, the Platonising texts cannot possibly be the product of some kind of outreach to Paganism or an attempt to self-Hellenise because they are full of these apocalyptic ideas that contemporary Pagan and Platonic philosophers were very hostile to and these were the ideas we talked about earlier. Different revelatory authorities than you had in Greek schools – the idea that the world was going to end, the idea of the elect that is set apart from the rest of humanity. If one wanted to write a contemplative text that a Platonic philosopher would like one would not conclude these things! Much less make them the focus, which is what you have with these Platonising Sethian Apocalypses all over this literature. At this same time it is true that you have no mention of Jesus of Nazareth, so what do you do here? My proposed solution is to try to cut the knot as it were by saying that perhaps the presence or absence of Jesus of Nazareth in these texts is not the question that we should be looking at because these texts could be products of one of the many groups that we know to have been present in the ancient world and medieval world as well as in ancient Mesopotamia and Palestine, which come out of some kind of biblical Abrahamic tradition but do not necessarily identify Jesus of Nazareth as the chief revealer and saviour. Some of these groups, for example, are referred to as Jewish Christian by scholarship because they have some affinities with Christianity and maybe even recognise the authority of Jesus on some level but they don’t necessarily identify him with God and they advocate adherence to the law. Other of these groups may have been new religious movements which clearly draw upon Judaism and Christianity but go in their own direction and a great example of this is Manicheism which comes out of the Persian empire and identifies Jesus as one of many saviour/revealers that appear throughout history culminating of course in the appearance of Mani and amongst some Jewish Christian groups as well as Manichean circles you have the idea that there have been many revealers who have come down throughout history and that Jesus was one of them and I think this may be what’s going on in the Sethian texts as well and this is why you don’t have Jesus mentioned in all of the Sethian Treatises. Rather you have Seth mentioned in all of the Sethian Treatises just as you have Mani mentioned in all of the Manichean treatises. You have different avatars which are mentioned for different reasons in different historical contexts and sometimes Jesus is one of them. The idea that you would have multiple saviour/revealers throughout history and that Jesus would be one of them is of course a very strong idea today in world religions because this is important in Islam. Jesus of Nazareth is one of the prophets. Mohammed got it from Manicheism most likely. Perhaps other Jewish Christian groups that he would have been exchanging ideas with as he was formulating his own religious ideas. So the idea that the Sethians had something similar going on in terms of who they identify as a revealer or saviour is not an outlandish idea at all. This is very common for ancient Abrahmic groups. MC: And speaking of John Turner, and this is something that I see other scholars missing, you do agree that certain texts like the Secret Book of John, On the Origins of the World, Hypostatis of the Archons, do reveal this sect or subsects of the Ophites and the Barbelolites, right? DB: I think this is true to some extent. I’m not sure that I would use the language of sects here because what we have are these documents, we have these books from Nag Hammadi and we can isolate these particular literary traditions within these documents, these sort of systems that are interacting with one another. But the idea that these literary traditions were products of social groups that moved around is a hypothesis. It’s not a bad hypothesis but it’s an extrapolation. We don’t have proof of that. So to speak of Sethians or Ophites who produced Sethianism and Sethian literature or Ophitism and Ophite literature is a jump that one should know is a jump. But it’s always reasonable to ask who put together these traditions and who’s interested in them – somebody must have! In any case, the category of Sethianism was devised in the 70’s by a German scholar – Hans-Martin Schenke – that was explored I think to its limits by John Turner in his pioneering work on the topic, especially Platonising Sethian Treatises. What Tuomas Rasimus, a Finnish scholar who’s now in Canada turned his Doctoral Dissertation in to a wonderful book “Paradise Reconsidered” is that several of the texts under the “Sethian” moniker, according to both Schenke and Turner, don’t seem to have much Sethian mythologemena in them at all and in one case – the “Hypostasis of the Archons” – I think also “On the Origin of the World” – there’s nothing about Seth. He’s mentioned very briefly but he’s certainly not the revealer or saviour. Rather these texts seem to have a different literary tradition which deals with descriptions of Yaldabaoth, the evil demiurge. The names and descriptions of his Stereomorphic Archons and especially the Paradise narrative. The famous story of the snake and whether or not the snake’s advice to eat from the Tree of Knowledge of Good and Evil is good or bad. Rasimus argues that in these so-called Ophite Treatises, so called for the Ophis from the Greek for snake, the snake’s advice is good advice. Now this of course is not sufficient to make Ophite traditions or other texts from the ancient world, including Nag Hammadi, where the snake’s advice is regarded as favourable but Rasimus does not regard as being Ophite per se since they say nothing about Yaldabaoth or about the Stereomorphic Archons and that belongs to the same traditions we find in the Secret Book of John, On the Origin of the World and the Hypostasis of the Archons. These texts also have particular ideas about the original heavenly couple, Adam and Eve, and their relationship to the heavenly man and heavenly woman that are shared with other treatises from Nag Hammadi like Eugnostos the Blessed and the Sophia of Jesus Christ. I find Rasimus’ analysis very convincing. It simplifies the Sethian category a good deal by cutting the fat as it were. Because the Secret Book of John, Hypostasis of the Archons and On the Origin of the World as Schenke himself recognises as well as Turner, they didn’t quite fit in with the other texts and you have to devise some sort of explanation as to how they got mixed up with this stuff and the whole reason that they were bound in to the category in the first place is that the Secret Book of John seems to be some kind of composite work that draws from traditions related to the Barbelo especially resembling the Theogony, resembling the account of the Gnostics who were interested in the Barbelo according to Irenaeus, in Book 1 of his book “Against Heresies”, Chapter 29 as well as some of these Ophite traditions. You’ve got the Archons, you’ve got the snake, the Stereomorphic Archons and their names and then a bunch of Sethian mythologemena, the names of the four luminaries, an the idea that Seth is revealer and saviour, they’re all in the Book of John, so it draws from all of these different traditions and since it is preserved in four manuscripts one (epitome?) being very widespread and relatively well preserved it’s assumed a real paramount importance for readers today as it must have in the ancient world as well. So, I think that when Schenke was putting together his idea of what constituted Sethianism he thought to himself, well, all these characteristics are in the Secret Book of John as well, so the Secret Book of John has to go in and so whatever is in the Secret Book of John has to also be Sethian and this would include some of the Ophite traditions that the Secret Book of John draws upon which you find, without Sethian traditions, in the “Hypostasis of the Archons” and “On the Origin of the World”. It’s of course an easy mistake to make and I think it is a mistake and Rasimus made a big contribution by pointing it out I think. What’s interesting is that when we recognise those Ophite traditions for what they are, when we look at the slimmer category of Sethianism we see that it is much more coherent. Almost every Sethian text is an Apocalypse. They all are interested in Seth as the revealer and saviour. They have a very consistent, core set of mythologumena. They are all interested in baptism on some level, although whether or not they are actually practising baptism with water is an open question. The category becomes a good deal more coherent and I think useful and defensible. MC: Some listeners might be saying “well, gee, look at Miguel and Dylan, they’re talking about Sethians and Ophites and Neoplatonism, and they might be thinking, well where is Gnosis? Does Gnosis have anything to do with it or is it simply borrowing from the saying “It’s the revelation stupid! ?” That’s where the Gnosis is? It’s all about revelation, apocalypse!! DB: I think there’s a very large extent to which it is all about revelation and apocalypse. Just about every Sethian text is an Apocalypse. One of the few Sethian texts that is not formally an Apocalypse – the Three Steles of Seth, which is actually a liturgical manual – gives it the title of an Apocalypse in Nag Hammadi Codex 7. So, it’s all about getting some sort of knowledge from beyond that is absolutely true and very important for you to acquire. However we choose to define the term “Gnosis”, some kind of salvific knowledge or important knowledge, it has much to do with notion of revelation, there’s no question about it. Gnosis has to be acquired some way, that would be a revelation itself, the context of Gnosis is very importance just as many Apocalypses deal with salvation or are concerned with matters that are extremely important to you, namely what’s going to happen to you in the afterlife or in the present life and every Apocalypse, every revelation has some sort of noetic quality, it tells you something, it can be verbalised and Gnosis is, of course, a verbalisation of this knowledge. I am only beginning to formulate my own thoughts on the matter but there’s a large extent to which I would say, well why is the question about Gnosis? We should really be talking about apocalypse and different Apocalypses for that matter. On the other hand, if one is interested in Gnosticism, the paranoid factor, the idea that there is a cosmic conspiracy that the creator of the world and the people working for him do not have your best interests at heart, that’s a distinct issue from Gnosis or from revelation for that matter, it’s a much more context-specific issue and particularly when it is paired to the idea that there’s a kinship between human beings and the divine. So, while lots of revelations seem to have dealt with Gnosticism in some capacity with over two dozen Gnostic Apocalypses extant from antiquity. Certainly not every Gnostic text is a revelation. MC: To end, Dylan, we both had a very good time at the Gnostic Countercultures conference in Rice University, Houston, and I had an amazing experience there, I’m sure you did too – do you have any words or any new takes or any Gnosis you got from the conference while you were there that you’d like to share? DB: Yeah, absolutely. The conference that took place at Rice was exceptional in that it wanted to focus on, as April DeConick, organiser of the conference put it, letting the Gnostic out of his cage. Saying essentially, there may be such a thing as Gnosticism after all and it can be pretty transgressive stuff to the extent that scholars have liked to use the term “Gnostic” over the past twenty years, they haven’t just been sceptical about using the term but when they do use it they’ve domesticated Gnosticism. The Gnostic Christians are just like any other Christians. They’re not very distinct and they’re pretty normal. All the wild stuff that’s attributed to the Gnostics – diverse exegesis or dualism, hatred of the body, libertine sexual practices, it’s all heresiological fiction. Rather, most Gnostics must have been like other Christians in everyday life, pretty normal. This conference wanted to look at Gnosticism as actually being a counter-culture and as Gnostic Christians not being like other Christians as a matter of fact, as being meaningfully different and it was interesting for me to see that a lot of really good scholars came and gave terrific papers that explored this theme in a number of different environments. The term “Gnosticism” and the idea of Gnosticism has been out in the wilderness for a good twenty, twenty-five years or so in scholarly discourse I think and it’s starting to make a comeback and it will be very interesting to explore with my colleagues as well as with you Miguel and the listeners of your show, what it seems to be, what it seems to have been and what it’s going to be in the future. MC: You’ve certainly given them a lot of revelation and we certainly have enjoyed it but I think that’s all the time we have today Dylan. 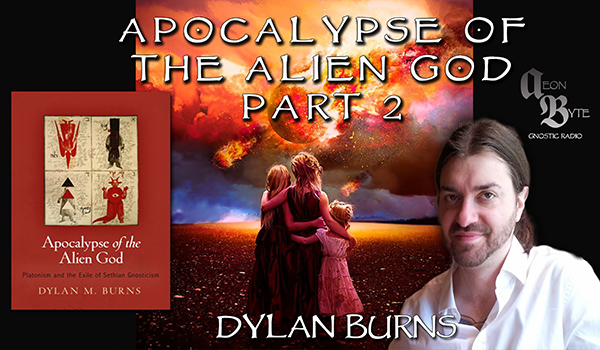 I’d like to thank you very much for coming on Aeon Byte to discuss your book Apocalypse of the Alien God and we certainly hope to have you on in the near future. Saklas in word affairs if their roles are different at all.Gnostic literature centers on Yaldaboath while the Bible centers on Lucifer who is the devil.I’m a bit confused!